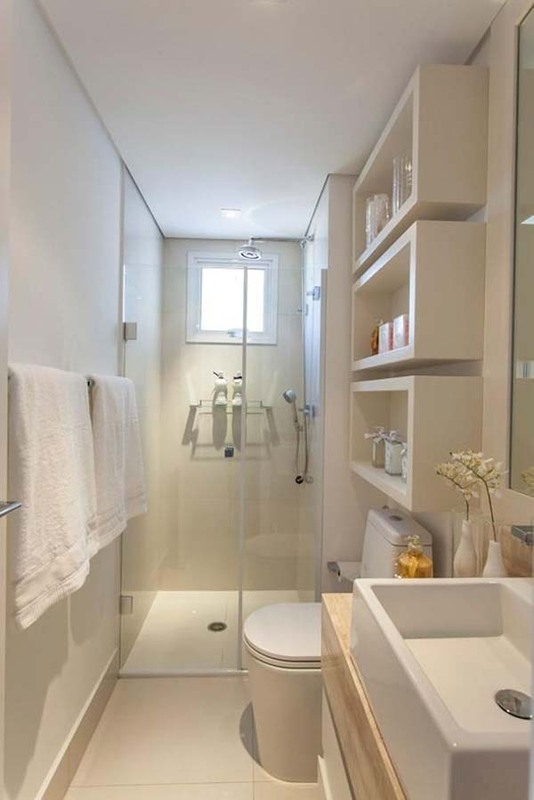 As you have seen, small bathrooms can be quite appealing and functional. 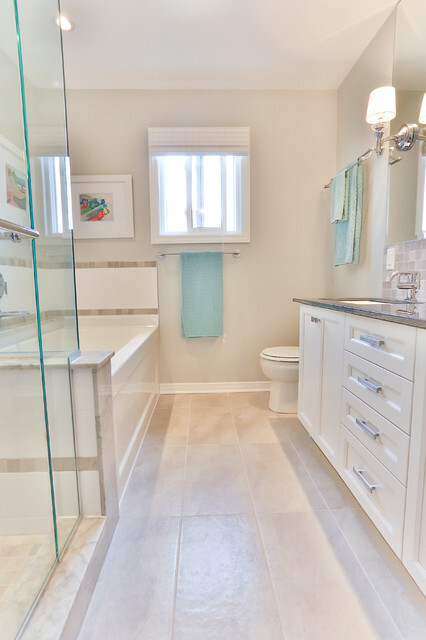 Careful selection of tiles, compact drop-in tub, hardware, and lighting can create an illusion of extensiveness and airiness, and what should be the aim when decorating a bathroom. 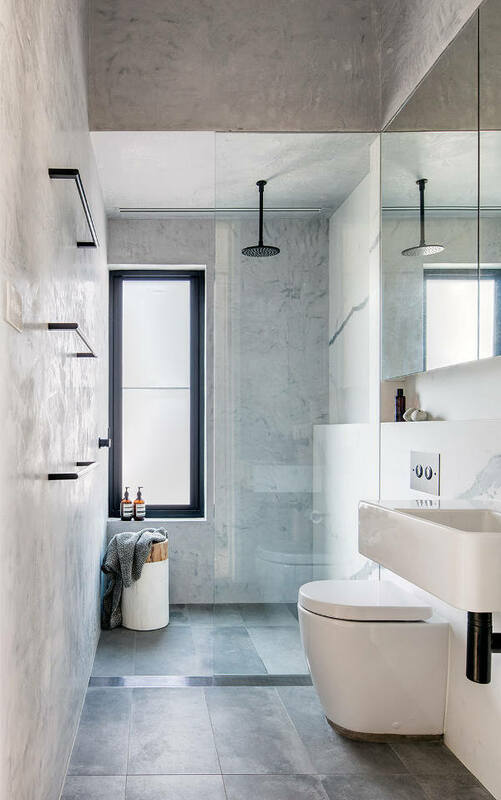 We have selected 21 spectacular small narrow bathroom design ideas so hopefully, you’ll manage to find the right one for you. 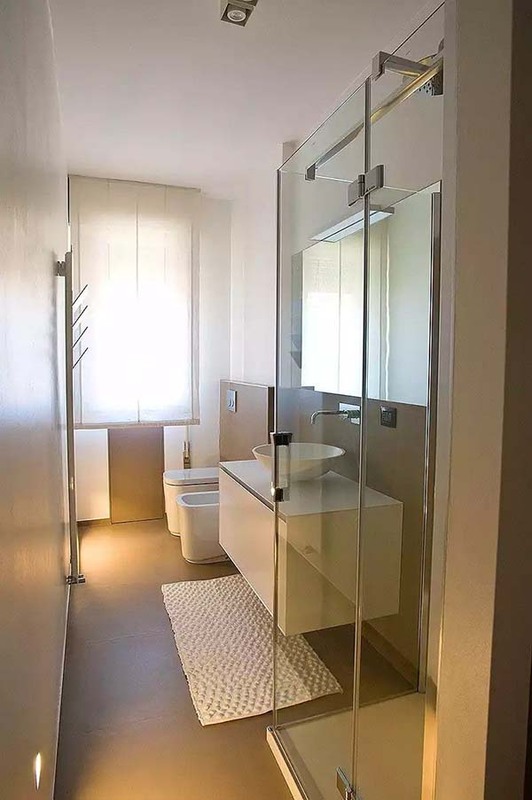 Instead of trying to find some great small narrow bathroom ideas on the internet, why don’t you just find a professional design agency that’s specialized in finding conceptual solutions for small spaces? 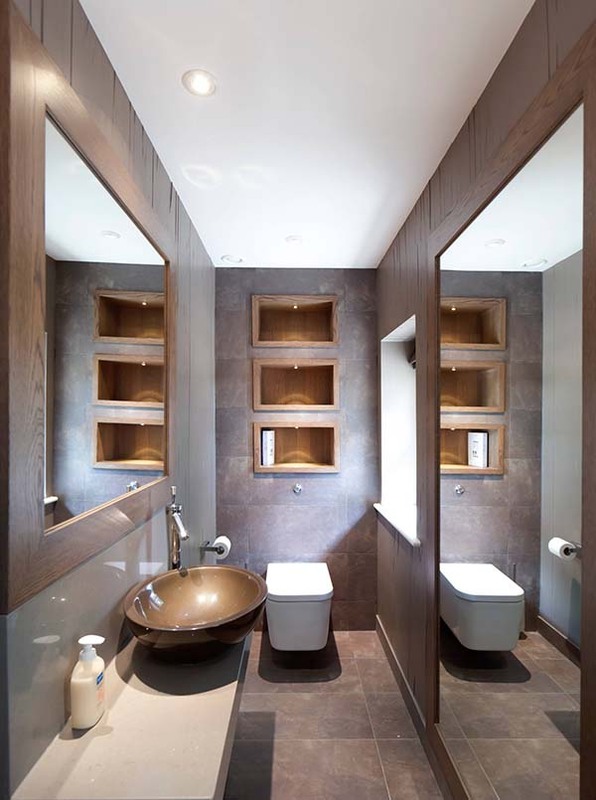 Here is an inspiration for a minimalistic contemporary bathroom. I do like the color of floor tiles and wall tiles, the frameless wide mirror, and the stylish wall in shower enclosure. 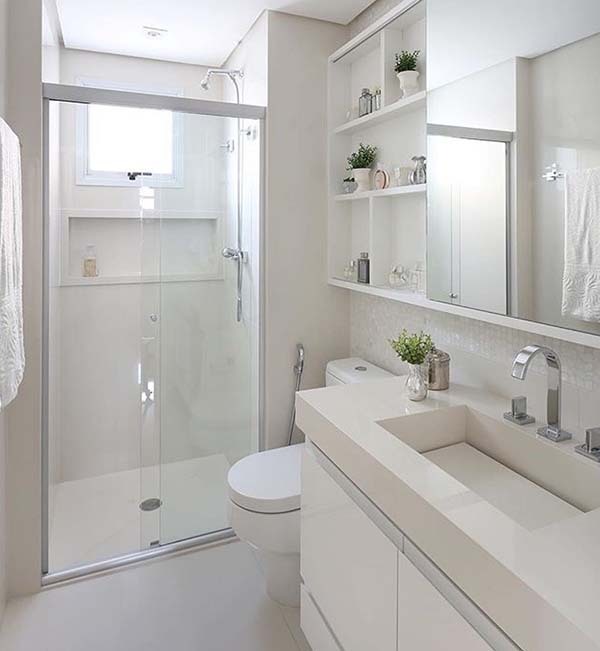 I guess you have already noticed that most of the tiny narrow bathroom ideas are painted in light colors as they make the small space seem larger and airy. 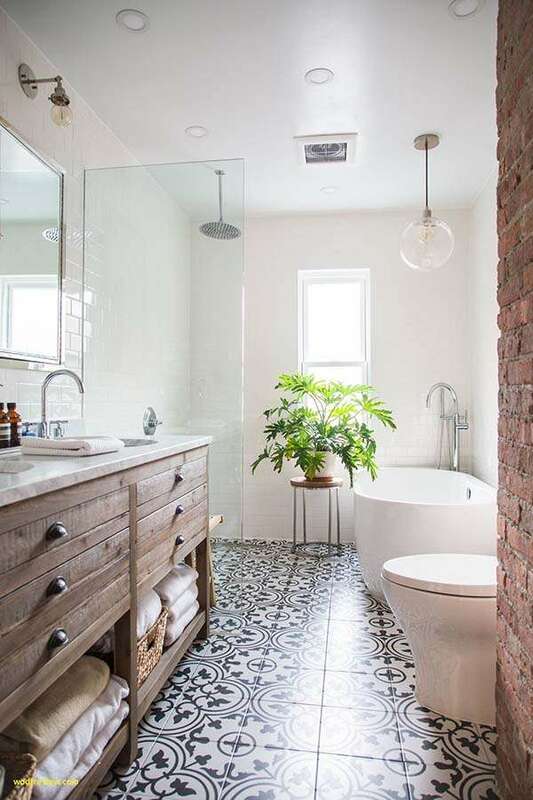 The wooden floor is right on the spot because the ceramic tiles are usually making the bathroom look even smaller. The triple over-sized shelf above the window is a true space-saver! 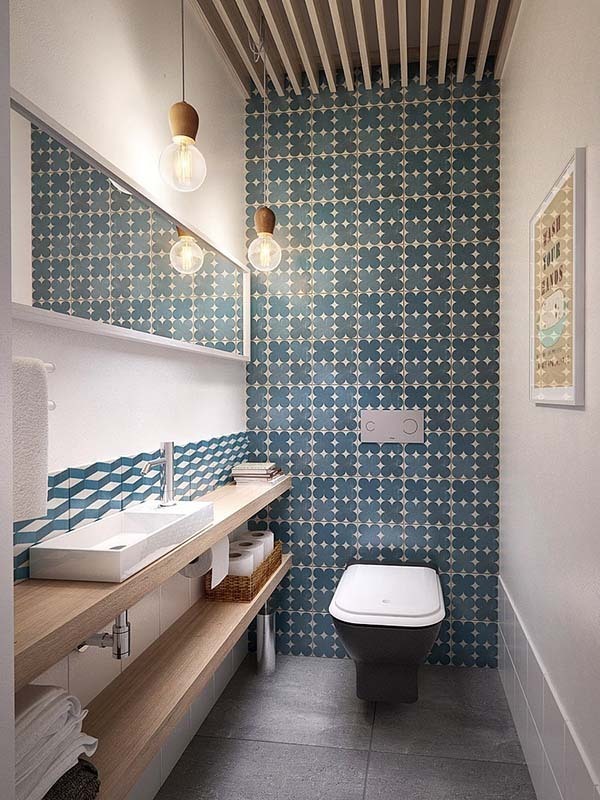 Certainly, this is one of the best narrow bathroom tile ideas I’ve seen so far! Instead of installing a double sink vanity, the long design can save you some serious space. The sink and the countertop are all one piece and it’s long enough that two people can get ready simultaneously. Here is a useful tip when searching for some very narrow bathroom ideas – runs tile from the bathroom floor straight into the shower stall. It makes the room seem more spacious. Changing materials will surely interrupt the space. In this contemporary bathroom, the white walls, the gold hardware, and high ceiling make the chic accents. The black cabinetry absolutely stands out. 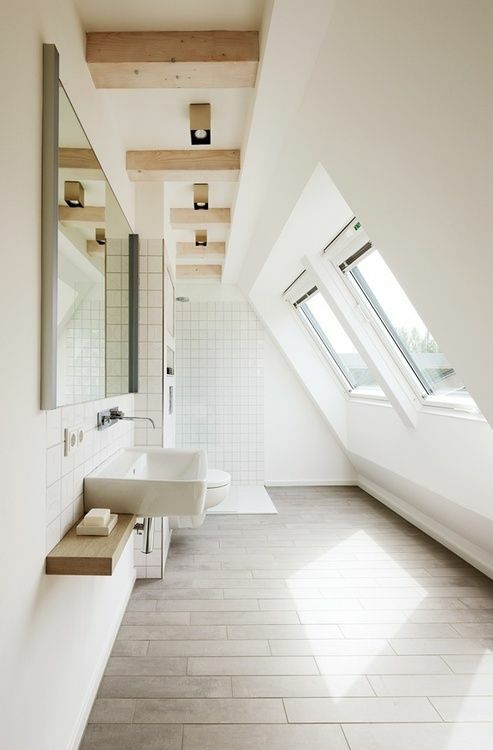 The skylight provides plenty of natural light to the bathroom space which makes it look more spacious than it actually is. 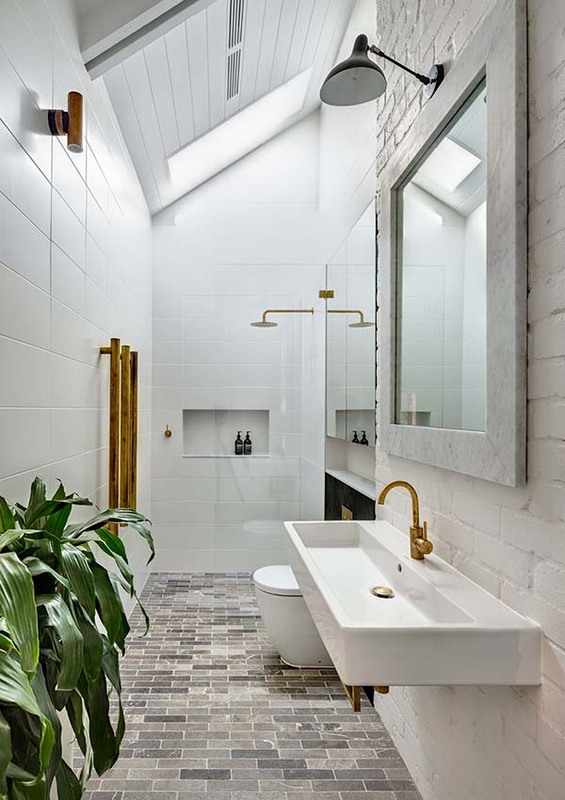 The brass shower attachments, such as the shower handles, the hanging lights, the towel bar, add enhancing elements to this stylish narrow bathroom, which keep the room design simple and open as a whole (but not overwhelming). 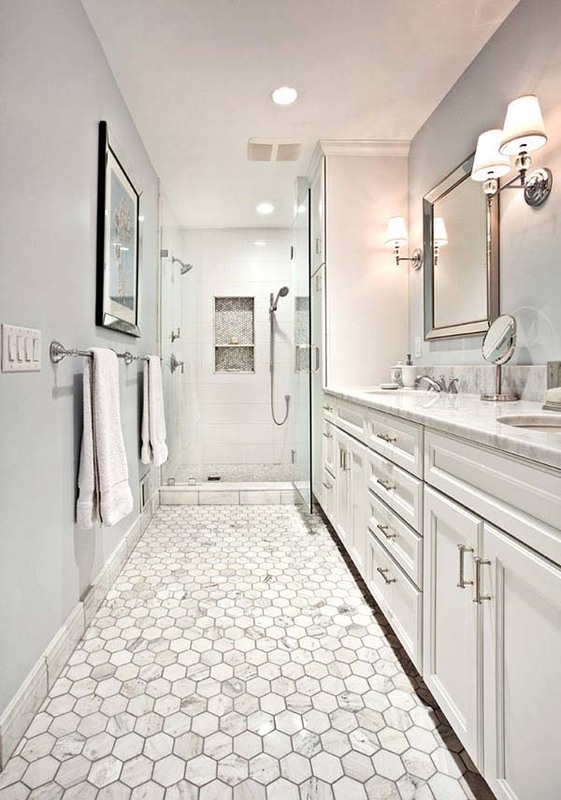 Most of the long narrow bathroom ideas are including simple metal (or brass) towel racks around the tub and the sink. Why? Because, first, they are very useful (say no to the tip-toeing around when you are soaking wet! ), and second, they are saving lots of wall space! Changing the shower curtain is one of the timeless long narrow bathroom decorating ideas. This upgrade is affordable and super exciting and it can make a big difference in your space. 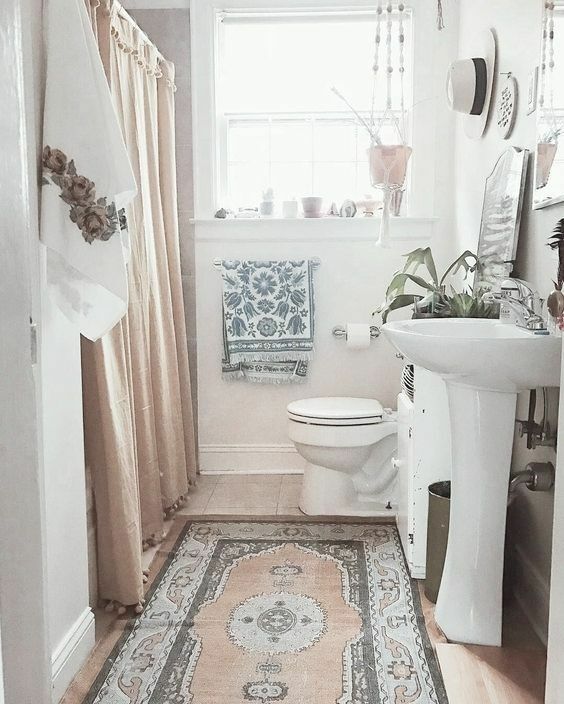 For those of you, fellow readers, who prefer the vintage narrow bathroom ideas with tub, here is a mid-sized classical bathroom in beige with light wood cabinets, in wall bath, black hardware, and a bold combination of ceramic and cement tiles. 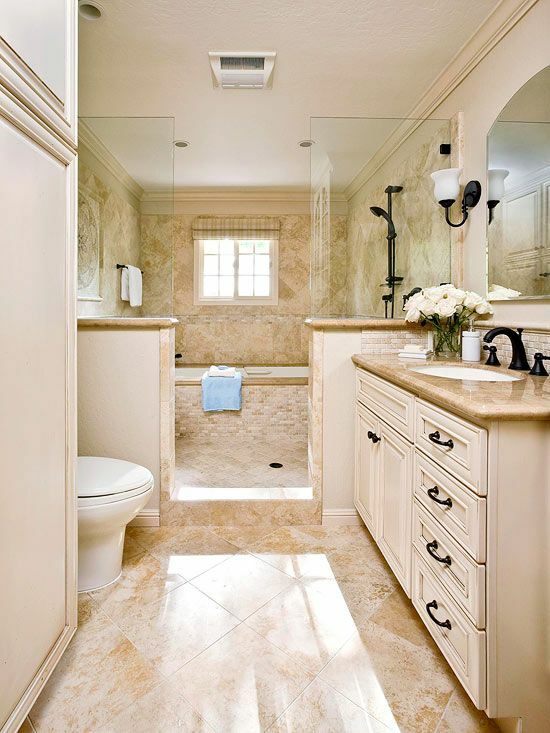 This superb master narrow bathroom with solid marble floor is lucky to receive so much daylight! By making the edge of your narrow bathroom elements soft and oval, you will surely gain some space and you’re less likely to bang into the edge when you’re in a rush. That’s a win-win situation! 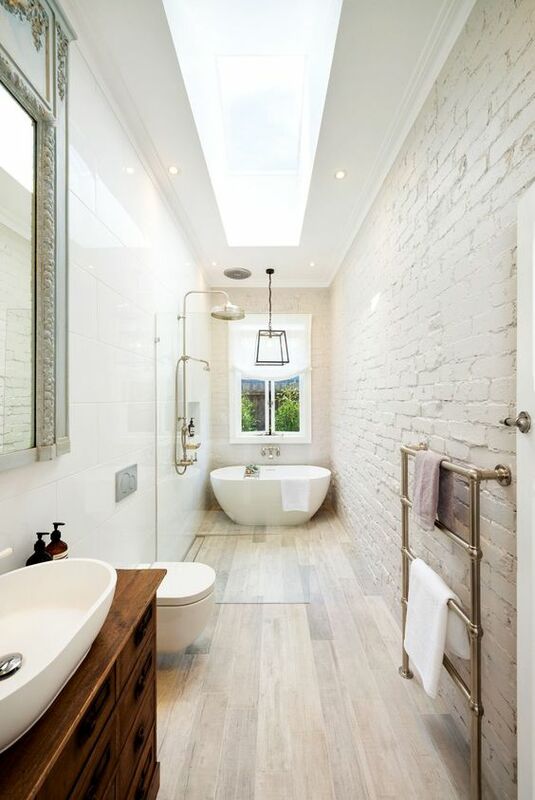 In my opinion, the hardest thing is to find some great narrow bathroom ideas when there is a cut roof as it steals lots of precious space. So in this case, the best thing to do is to keep it simple and minimalistic. In other terms, make sure every piece has a purpose. Have you noticed that lots of narrow master bathroom ideas advice you to skip the foggy glass or dark curtain, and go for glass doors? It will make the shower feel like homey square footage. Another easy way to bring life back to your tiny bathroom space, is to add some greenery. Here is an idea – use a curtain that looks more like a drape than the traditional cheep-looking plastic shower curtain. Go to some thrift shops around your area and hunt for some treasures. 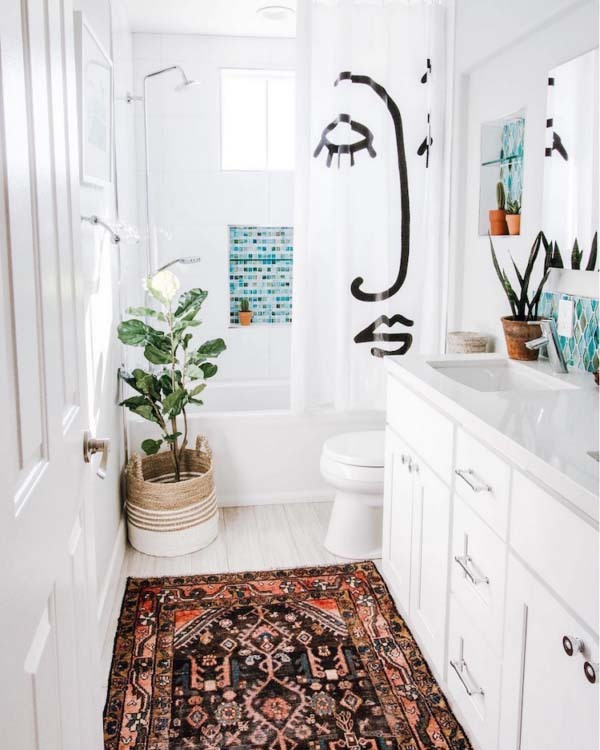 The unusual curtain won’t only make the bathroom space feel more sophisticated, but it also makes the shower feels like another (bonus) room! Sometimes the enormous built-in unit is just not worth the bulk. 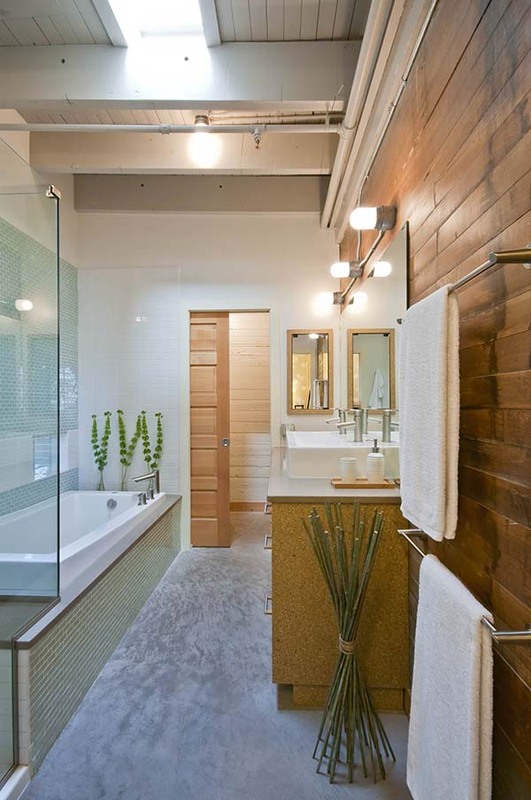 In fact, most of the long narrow bathroom design ideas are ditching it. 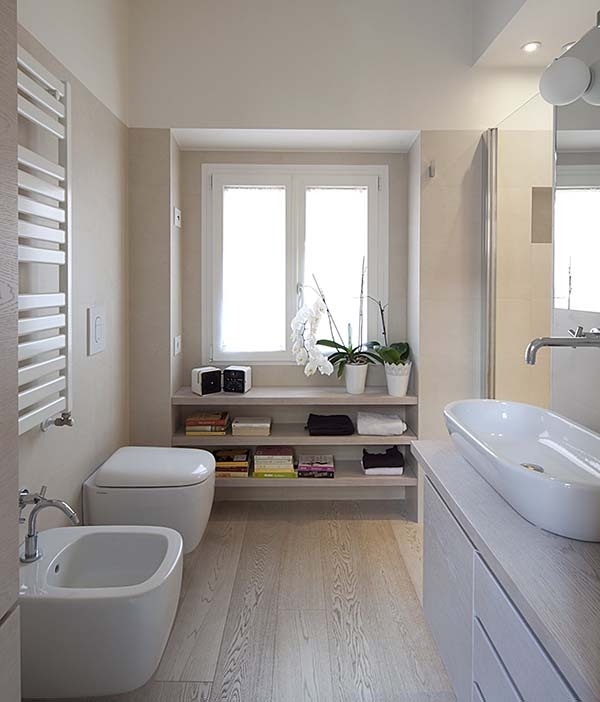 Here, a simple wooden countertop with some shelving feels slimmer and gives some thinness to the bathroom space. Instead of a fluffy shower curtain that takes up lots of space in your small narrow washing room, pick a glass door on a rail that stays parallel with the wall at all times. 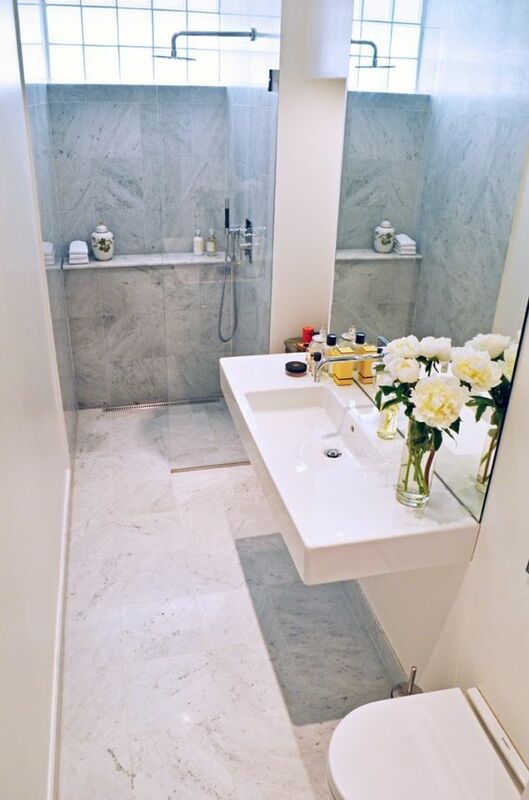 This French hotel style washing space is definitely one of my most favorite narrow bathroom remodeling ideas! The recessed ceiling is being removed, so there is enough room for the shelf at the top – a real game-changer! There are some very bold elements such as the solid marble countertop combined with different tiles, and the golden hardware (which, for me, is the centerpiece in this design). If you have a small narrow bathroom, consider replacing your old bathroom fixtures with some compact, space-saving, elongated models. Vanities for small bathroom are an option to save more space. Besides, one of the most popular small narrow bathroom ideas is to ditch the bath tube (i know, i know) for a shower space. 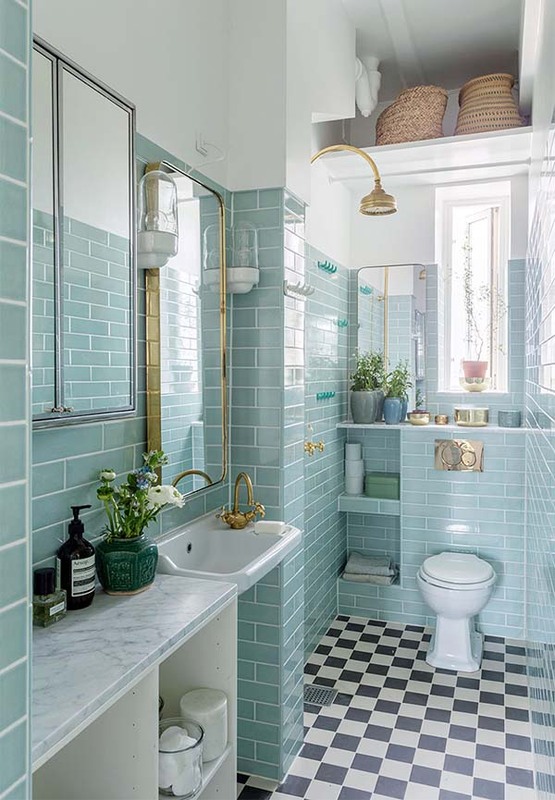 Following my list of narrow master bathroom ideas, here is a majestic design of a classic washing room in mint-green and white, with a built-in vanity and flat-panel cabinets. The solid marble countertop surely gives a luxurious feel. Take a look at the lighting which is very smart planned and made as the room doesn’t have an access to direct sunlight. Since the oval shapes appear to stretch upwards, they make ceilings feel higher and the small bathrooms feel more spacious. The egg-shaped sink looks smoother and gives you more counter space than a square. Let’s face it – if you don’t have enough drawer space, you need every inch of counter you can get. This is why several narrow bathroom ideas focus on the oval mirrors or sinks. 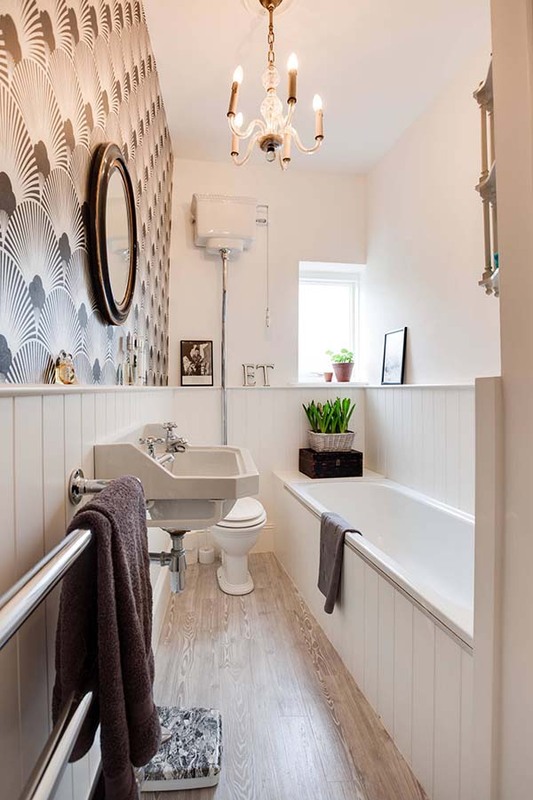 If your tiny narrow bathroom suffers from a major lack of storage space, why don’t you go for a ledge right above the sink? This can hold all your daily essentials, plus some pieces of art but won’t take up as much floor – and wall space. Make sure every piece of furniture in your narrow bathroom has a purpose. For instance, choose drawers under the countertop if you don’t want to go for an old-fashioned medicine cabinet. Also, don’t forget the tower racks.